Alternative from Almo Nature is a complete food for adult dogs. One bag of Alternative contains at least 50% fresh salmon, which was originally suitable for human consumption. Salmon is the only protein source, making this food ideal for dogs with a food allergy or intolerance. Salmon is the main ingredient of Almo Nature Alternative and contains fatty acids that support the cardiovascular system. Because Alternative contains a single protein source and a single cereal type (rice), the food is suitable for dogs with a food intolerance or allergy. No offal is used in the production of Alternative from Almo Nature. This dog food contains at least 50% fresh fish (salmon) with the so-called HFC label. This means that the fish is approved for human consumption. This pure and fresh quality fish does not contain any genetically modified organisms (GMO) and is therefore suitable for dogs with a hypersensitive reaction to food. XS/S: Suitable for small adult dogs weighing up to 10kg. M/L: Suitable for medium to large adult dogs weighing over 10kg. 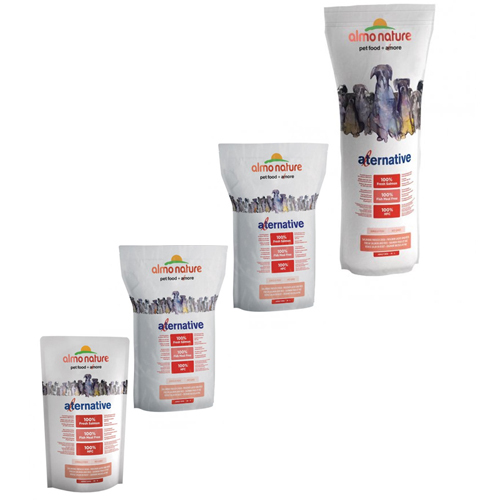 Almo Nature Alternative is available in a pack of 750 grams, 3.75kg or 9.5kg. Fresh salmon 50%, rice 42%, beet pulp, potato protein, animal fats, salmon oil, hydrolysed fish protein, minerals, vitamins, yeast, mannan-oligosaccharides (MOS) 0.1%, fructooligosaccharides (FOS) 0.1%, calcium 1.34%, phosphorus 0.83%, Omega 3 1.5%, Omega 6 3% and moisture 9.5%. Have you used Almo Nature - Dog - HFC Alternative - Salmon & Rice before? Let us know what you think about this product.